SAO PAULO: Police in Sao Paulo fired tear gas, stun grenades and rubber bullets Thursday to break up an anti-World Cup protest on the morning the Brazilian mega-city hosts the tournament's opening match. 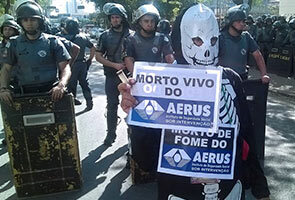 Dozens of protesters gathered near a Sao Paulo subway station with a red banner reading "If we have no rights, there won't be a Cup," saying they planned to march as close as possible to Corinthians Arena, the city's World Cup stadium. "The objective is to put an end to the World Cup. We realize we're not going to achieve it, but we believe Brazilians should rise up," he told AFP. "Brazilians love football but they don't need this (World Cup) right now."